Here are the most frequently asked questions we receive from visitors and callers. Check back for updated information. If you have a question directly related to the 403rd Wing that is not answered here, please contact the Public Affairs Office. You may also find the answer you are looking for by visiting the Questions page of Air Force Link. If you have a general military question, please refer to the Department of Defense Frequently Asked Questions page. How can I find a list of Air Force bases, both overseas and stateside? I need to obtain the words to the Air Force song. Can you help me? In 1938, Liberty magazine sponsored a contest for a spirited, enduring musical composition to become the official Army Air Corps song. Of 757 scores submitted, the one composed by Robert MacArthur Crawford (1899-1961) was selected by a committee of Air Force wives. The song (informally known as "The Air Force Song" but now formally titled "The U.S. Air Force") was officially introduced at the Cleveland Air Races on September 2, 1939. Fittingly, Crawford sang in its first public performance. Nothing'll stop the U.S. Air Force! Gave us wings, ever to soar! With scouts before And bombers galore. Hey! Bridge: "A Toast to the Host"
To a friend we send a message of his brother men who fly. Then down we roar to score the rainbow's pot of gold. A toast to the host of men we boast, the U.S. Air Force! We'll be there, followed by more! In echelon we carry on. Hey! Tours to the Air Force Reserve Command's 403rd Wing are offered on a noninterference, case-by-case basis to local civic organizations, schools and youth groups to educate its members about the United States Air Force Reserve and, more specifically, the mission of the 403rd Wing. To tour Keesler Air Force Base and the 81st Training Wing, please contact their public affairs office at 228-377-2783. Please fill out this form and either click "submit by email" at the bottom of this form, or print the form and fax to 228-377-0755 or scan and email to the Public Affairs Office. For instructions on how to fill out the form, please review below or call 228-377-2056. Transportation - Organizations are responsible for their own transportation. Tours are limited to one busload. Unfortunately, requests to use multiple vehicles cannot be accommodated. Base tours are conducted on a limited basis due to our manning, resource availability and heightened security posture. A tour request does not guarantee a tour will be approved. All scheduled tours are subject to cancellation based on emergency situations, worldwide commitments, real world events, etc. Priority scheduling will be given to Junior ROTC students and other youth groups serving high-school-age students with a recruitment potential. Civic and business organizations are also welcome to request tours to the 403rd Wing. Day care, elementary or middle-school-age groups are encouraged to request a speaker from our Speaker's Bureau program to schedule a multimedia presentation in their place of business. If your group meets the criteria, please download the form located at www.403wg.afrc.af.mil and send it to 403wg.pa2@us.af.mil or print the request and fax it to 228-377-0755. For additional assistance in filling out the form please call 228-377-2056. Air Force and DOD assets belong to the American people and participation by Air Force people and display of Air Force equipment in public events furthers public understanding of the Air Force mission. Since limitations of time and money make it impossible to grant all requests, public affairs will take all appropriate requests into equal consideration and recommend approval based on common factors that are in the best interests of the Air Force and taxpayer. Tours will be conducted on a noninterference basis only. Public Affairs is required to ensure there is minimal interference with normal training or operational activities, determine if it is economically feasible, and make sure appropriate resources are available. Requests for tours to the 403rd Wing will be handled on a case-by-case basis, but typically the Public Affairs office cannot accommodate personal tours for friends, family members or those stopping through on vacation, regardless of current or prior military service. However, if an individual has access to the base (a military or DOD civilian ID cardholder) one may visit Keesler Air Force Base. We also cannot accommodate tours to visit the 53rd Weather Reconnaissance Squadron "Hurricane Hunters" from June 1-November 30 due to mission requirements. Requests for tours must be made 30 days in advance, but since we are only able to accommodate two tours per month, more than 30 days notice may be required to secure a slot. No tours will be given on weekends or federal holidays. Tours are free of charge. The minimum age for a tour attendee is 10-years-old. For participants under age 18, a general talent release DD Form 2830 must be filled out and returned to the 403rd Wing Public Affairs office prior to the tour. This form is to allow 403rd public affairs Reservists to take pictures, use the name of and/or voice of an infant or minor child for official government publications. Are there other stops in addition to 403rd Wing activities? If you would like to tour Keesler Air Force Base's training mission or their facilities, please contact the 81st Training Wing Public Affairs Office at 228-377-2783 for more information about their mission and possibility of scheduling a tour. Can I bring my camera on the tour? Cameras are allowed on the tour; however, there are some restrictions. Your tour guide will inform you of these restrictions. Does the 403rd Wing provide transportation for base tours? No. Tour groups must provide their own transportation, which is limited to one busload. How do I request/schedule a tour? Groups requesting a tour must complete this Tour Request Form and e-mail it to the 403rd Public Affairs Office. Tour requests must be submitted no later than 30 days prior to the date of the tour. Requests must be submitted through the 403rd Wing Public Affairs Office and are accepted up to six months in advance. Tours are coordinated one month in advance. A particular day of the week may be requested for the tour, but there is no guarantee that a tour will be available on that day until your tour is confirmed. No tours will be given on weekends or federal holidays. Tours are free of charge. Please note tours may be subject to last-minute cancellations due to mission requirements. Modified tours may be granted to those with limited mobility. However, this must be stated on the request. If not stated, it is assumed that walking and stair climbing is not an issue. We will review your request and notify you as soon as possible. How many people do we need to schedule a tour? The minimum number of people to schedule a tour is 20. The maximum number of people allowed on a tour is 40. Please consider inviting a speaker from our Speaker's Bureau program for groups in excess of 40. How much notification do we need to give to schedule a tour? Tours must be scheduled a minimum of 30 days prior to the desired date of the tour. What does a tour consist of? Tours start at 9 a.m. and are scheduled for a maximum of 3 hours. 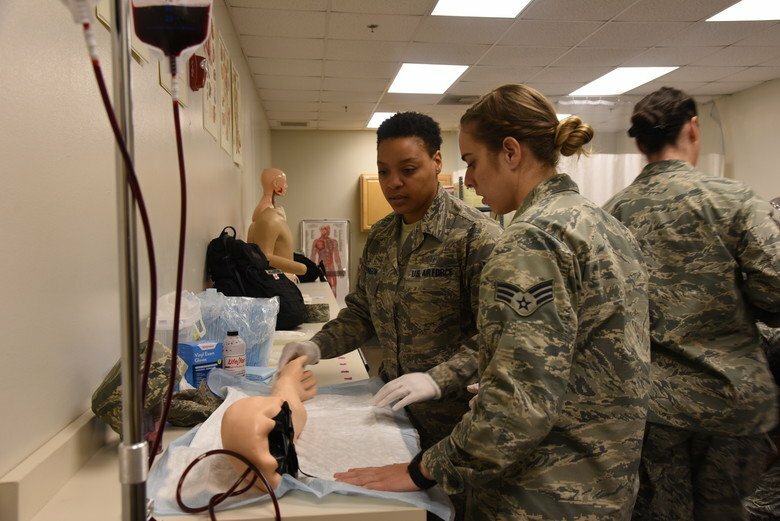 Tours of the 403rd Wing may include any of the various organizations on base to include static displays and demonstrations, however, no particular activities can be guaranteed. Every effort will be made to honor your request but, ultimately, we work around our daily operations schedule. If mission dictates, a tour may be cancelled at any time, without notice. There will be no substitutions during these cases. What kind of vehicle should we use? Groups are responsible for transportation large enough to carry the entire group and a tour guide. All buses/vans must arrive at the White Avenue Gate for security processing. Please confirm vehicles used and directions to the White Avenue Gate prior to arrival. When can I schedule a tour? Call the 403rd Wing Public Affairs Office at 228-377-2056 to schedule a tour. No tours will be conducted to the 53rd Weather Reconnaissance Squadron during Hurricane Season, which is June 1-Nov. 30, due to mission requirements. There are no tours during weekends or holidays. Where should our tour bus/van enter the base? Tour groups should enter the base through the White Avenue Gate where they will be met by a public affairs representative. From I-10 turn onto I-110 South. From I-110 South approximately 3.0 miles (Only two exits will be at the end of bridge) take the left exit that will take you to US-90 West. From US-90 West approximately 1.5 miles (Second red light) take a right on White Avenue. Stay on White Avenue until you reach Keesler's main gate. Turn right onto US-49 North. From US-49 approximately 0.6 miles merge onto I-10 east toward BILOXI/ MOBILE. From I-10 approximately 12 miles turn onto I-110 South. From I-110 South approximately 3.0 miles take a right on US- 90 West. From US-90 West approximately 1.5 miles take a right on White Avenue. How can I find information about civilian employment? All job openings on Keesler AFB are posted on the OPM website - http://www.usajobs.gov or on the Air Force Civilian Employment website https://ww2.afpc.randolph.af.mil/resweb. For Non-Appropriated Fund (NAF) positions at Keesler, please call 228-377-9055, you will get a recording with job openings and instructions on how to apply for the openings. If you would like to speak with an individual at NAF please call 228-377-9032. How can I get a flight on a C-130 aircraft? If you are retired military, active duty or another qualifying individual, see the instructions under the Space Available Travel topic. Members of the general public cannot fly on board military aircraft participating in their missions, such as aerial combat delivery or hurricane hunting missions. Working members of the media are encouraged to read the Media Topics FAQ. How do I join the Air Force Reserve? For general inquiries on joining the Air Force Reserve, visit the following website: afreserve.com/how-to-join. If you would like information on how to join the Air Force Reserve 403rd Wing, contact a recruiter at 228-377-2815. Will Keesler Air Force Base have an air show this year? The 403rd Wing participates in any air shows hosted by the 81st Training Wing and Keesler Air Force Base, but does not schedule or host these events. See the 81st Training Wing public web site at www.keesler.af.mil for updated air show information. I am a working print or broadcast journalist, how do I get a flight with the Hurricane Hunters? If you're a bona-fide member of the media, you must first get into the media pool for permission to fly on one of our storm missions. Call our 403rd Wing Public Affairs office at (228) 377-2056 during normal office hours (8 a.m.- 4:30 p.m. Central time). Please call as soon as possible, because our flights fill up fast--especially when the storm approaches land. We can take up to three media outlets at a time. Please limit the number of people you send to two. If you'd like to film on a training (non-storm) flight before or after hurricane season, please allow up to 30 days to coordinate permission. I have been notified that I have a flight scheduled with the Hurricane Hunters or Flying Jennies, what equipment should I bring? Bring plenty of spare batteries. We do not have a power source to recharge on the aircraft. If recording sound, consider a small remote (peanut or lapel) microphone which can be placed inside your headset (we'll loan a headset, which you may need to share). It's about 110 decibels inside the plane, and the headset is about the only way to be heard and understood. A hand-held microphone works well for you to provide commentary without interrupting the crew. A camera-mounted microphone doesn't work as well as a hand-held microphone. If you're lucky enough to fly into a well-formed hurricane eye, (most do not show the "stadium effect"), a wide-angle lens works well. Some excellent video has been taken with a lipstick camera up against a window (with a suction cup). Some polarizing lenses pick up interference from our windows, so look out for the "rainbows". Radio-transmitting (wireless) microphone systems have been known to fail inflight, possibly due to interference with aircraft radios. We suggest using or at least bringing cables. Please be aware that if any of your equipment interferes with the aircraft' s electronic systems, you'll be advised to stop operation. How can I obtain military records? The individual military departments do NOT maintain files or records pertaining to individuals no longer on active duty. When an individual is separated from military service (because of retirement, discharge from active duty, or death) his/her Field Personnel File (containing all military and health records) is forwarded for storage to the National Personnel Records Center (Military), 9700 Page Boulevard, St. Louis, MO 63172. The Records Center is under the jurisdiction of the National Archives and Records Administration (NARA) of the U.S. Government. Their web site ishttp://www.archives.gov/research_room/obtain_copies/veterans_service_records.html. An individual's complete service record is available to the former service member or, if deceased, to his/her next of kin (parents, spouse, or children). Limited information (such as dates of service, awards, and training) is available to anyone. Not available to the general public is information which would invade an individual's privacy, such as medical records, Social Security number, or present address. The St. Louis Center receives many thousands of requests for service records each week, so please be aware that there may be a lengthy delay. The St. Louis Center will process requests with greater speed and accuracy if the requester uses a Standard Form 180, "Request Pertaining to Military Records." The form is available as a Portable Document File (PDF) (Click here.). If you do not have the reader software, it is available free of charge from the company which produces it, Adobe, (Please click here). now use a new online military personnel records system to request documents. Other individuals with a need for documents must still complete the Standard Form 180 that can be downloaded from the online web site. veterans for additional information will be minimized. Veterans and next of kin may access this application at http://vetrecs.archives.gov. If you are having trouble downloading the form, you may request one from our office by submitting a question on this system. If you want us to send you the form, please include your name and postal address. 1) Contrary to published accounts, the Department has not published a "booklet on military records," but we hope the above information will be useful. 2) Of incidental interest for individuals compiling family histories: the National Archives and Records Administration (NARA), 700 Pennsylvania Avenue, NW, Washington, DC 20408, (telephone: 202-501-5400) provides assistance to those interested in genealogy. NARA normally charges a nominal fee for research and reproduction costs. How do I get Hurricane Hunter, Flying Jennies or other 403rd Wing unit patches, uniform items or other memorabilia? The 403rd Wing is not able to provide patches, uniform items, and other forms of military memorabilia. However, several private companies exist to meet your needs. Try searching on the Internet for military memorabilia. How do I get information about Space Available Travel? Please contact Base Operations at 228-377-2120 or DSN 597-2120 for Space A Travel. How do I get someone from the 403rd Wing to speak to my class, community organization, etc.? E-mail Public Affairs the dates you need a speaker, the size and type of audience and the target age group. It would also help to provide some background on the event and specific topics your group would like to hear about. If you are requesting a specific member of the unit or a person with a specific job (pilot, loadmaster, navigator, maintenance, etc.) note this in your request. Be sure to include a point of contact with a good daytime telephone number. All requests are accomodated based on the operational schedule of the 403rd Wing. Even when an event has been scheduled, it is possible that a speaker may have to cancel on short notice due to a mission. Requests for speakers from the 53rd Weather Reconnaissance Squadron (Hurricane Hunters) are not possible during the hurricane season, June 1-Nov. 30. Please request a speaker from one of our other squadrons or groups during this very busy time. I am interested in obtaining military aircraft for a civilian airshow. What do I need to do? I am interested in getting in contact with a buddy I used to be stationed with. Can you help? Individuals who are trying to contact current or former members of the Air Force are encouraged to contact the World Wide Locator service located at Randolph Air Force Base, Texas. The telephone number to the World Wide Locator is (210) 565-2479. Col. Jefferey A. Van Dootingh, Chief of Staff, 22nd Air Force, Dobbins Air Reserve Base, Georgia, will serve as the Commander, 403d Wing, Air Force Reserve, Keesler Air Force Base, Mississippi. Swan 38 Memorial Scholarship is now open to taking applications. April is the Month of the Military Child. The 403rd Wing appreciates all military children who stand with our Reserve Citizen Airmen. We are honored to have them in our Wing family. White Avenue gate is now open. The AF Reserve Hurricane Hunters had a surprise visit from Luis Guzm&#225;n today. The Caribbean Hurricane Awareness Tour promotes preparedness but it is also a partnership building endeavor.